I was very pleased to present UnBias’ data at two great recent UK events that addressed children’s safety and wellbeing and children’s rights at: the NSPCC annual conference, ‘How safe are our Children? Growing up online’, 20th-21st June, in London and at the launch of the ‘Children, Rights and Childhood’ event, on 22nd June in Birmingham. 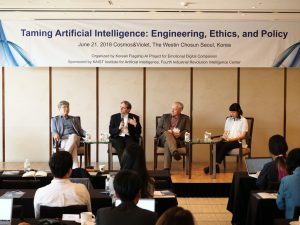 On June 21st 2018, the KAIST Institute for Artificial Intelligence, Fourth Industrial Revolution Center in Korea hosted a public forum discussion on “Taming Artificial Intelligence: Engineering, Ethics, and Policy to discuss the ethics of artificial intelligence technology development as well as policy making around the world. How to create your own Data Garden! The Nottingham UnBias Team has been working with children aged 3-13 years to help them to learn how the internet works and to reflect on issues of personal information and online filter bubbles, through creating their own “data gardens”. We attended a Family Discovery Day on the 16th June at the University of Nottingham and the STEM Festival at Bluecoat Beechdale Academy on Saturday 23rd June. We are pleased to announce that UnBias won one of the three 2017 RCUK Digital Economy Theme ‘Telling Tales of Engagement’ awards. The evaluation process for this award considered both the impact of our previous work and a proposed new activity to “tell the story” of our research. Our submission was titled “building and engaging with multi-stakeholder panels for developing policy recommendations”, highlighting the importance to our research of engaging with our stakeholder panel and with organizations that are shaping the policy and governance space for algorithmic systems.